Underworld Connections Description: Link displays somnambulism in the middle of the night an unconsciously sneaks toward Zelda's room. Zelda sees his approach and wakes him in time to see gargoyle-like vires attack and try to steal the Triforce of Wisdom by blowing it into smaller pieces. 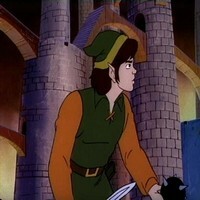 With only a fragment of the Triforce still in their keep, the pair head to the Underworld to recover them. survyguy79 Well Excuuuuuuuuuuuuuuuuuuuuse me, Princess.